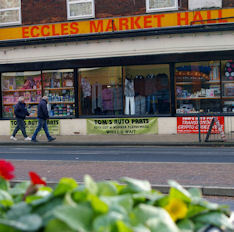 Eccles Old Indoor Market (opposite Aldi on Church Street) is a venue which has served the community and grown in popularity for well over 50 years. Why not drop in to see a variety of last minute holiday or gift ideas. Get your meat here fresh daily, sweets and cakes, or refurbish your home with quality beds. Fashionable clothing and accessories for every season, crafts and alterations, and tools for all those odd jobs at prices you can afford. Come and join us for lunch at our Cafe open daily from 9am to 3pm and meet our friendly and helpful stall holders who will be happy to find the perfect gift to make everyday a special one.